This Pigs in a Blanket recipe remix is quick, simple and best of all, delicious! All you need are some breakfast sausage links and your favorite flavor of De Wafelbakkers pancakes, and you?ll be ready to let the good times roll! Follow the microwave instructions on the package to heat up 6 De Wafelbakkers Pancakes – whichever flavor you prefer! Cook 6 breakfast sausage links (according to the packaging). Once pancakes and sausages have cooled for a moment, it’s time to get rolling! 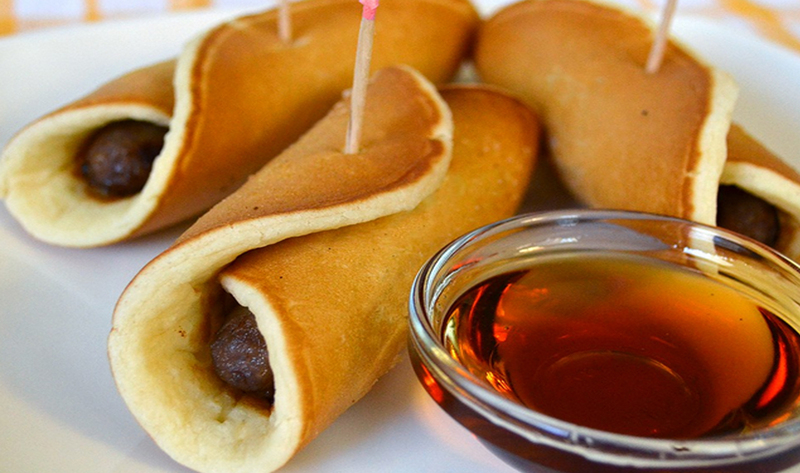 Place one breakfast sausage link in the center of one pancake, and wrap the pancake around it. Once your sausage is nice and snug, secure with a toothpick. Lastly, warm up a small cup of maple syrup for dipping and enjoy!